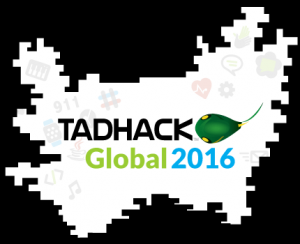 TADHack Global was massive, 2600 registrations, over 170 hacks. We delayed announcement of the winners until Wednesday 19th Oct as we did not want to miss any hack, every single hack is reviewed both locally and globally as their quality is world-class. The global judges had an exceptionally hard time deciding given the quality of the hacks. Innovation and world-class talent are everywhere! A big thank you to everyone who took part in TADHack Global, you created a unique global event. It was unprecedented, we should all be proud of what was achieved. Please grow the friendships you built over an extremely intense weekend. And of course a big thank you to the Global Sponsors who made TADHack Global 2016 possible: Carrefour, Canonical / Ubuntu, Cisco Spark, hSenid Mobile, Matrix, Project reThink, Telestax, Tropo, and VoxImplant. And the many, many partners running locations around the world, thank you. All your hard work created the largest global hackathon over one weekend. At the TADHack YouTube channel you can see all the videos segmented by location winners, global winners, and all the pitches from all the locations including remote. Just click on any of the winners listed below to see their pitch video. At the start of each location we had some intro videos that you can see here, from the sponsors and a keynote from Mark Shuttleworth, founder of Ubuntu and Canonical. We also link through to all the pitch videos at the end of this weblog, as one thing we’ve learned over the years is the most commercially successful hacks are not necessarily prize winners. We show the winners in a slideshow as well as listed out in this weblog. From Berlin. Hack: snappy kamailio. By Daniel-Constantin Mierla. Running kamailio on snappy received Canonical Global prize of $1k. Canonical also created a special prize allocation for interesting hacks built on Ubuntu. Please note next year ONLY hacks built on snappy/juju hacks get prizes. From Chicago. Hack: Outsider. By Ermir Suldashi. Scalable voice broadcasting. Received Canonical special prize of $250. From Zambia. Hack: Avengerrs. By Mchotsa Banda, Daryl Lukas, Chobela Kakumbi, Itati Dzekedzeke, Joshua Chipile & Sibusiso Ngoma. An event ticketing platform (web/mobile application) that allows users to buy event tickets using mobile money. Received Canonical special prize of $250. From TADHack Mexico. Hack: Automator central. By Jose Luis Calderon and Armando Montoya. Broadcasting platform to centralize all the communications between the network of devices agnostic of device type and vendor. Received Canonical special prize of $250. From South Africa. Hack: Geasy. By Robert Sandell. An energy monitoring solution using MQTT and Mobile IOT. Received Canonical special prize of $250. From Madrid. Hack: SmartWeb. Team: Adrian Velásquez, Andres Muñoz Arcentales, and Andreina Montoya. Improve customer experience with recommender and SMS payment and backend pattern change detection. Received the Carrefour prize of 3000 Euros. From San Francisco. Hack: Smart Evacuation System. By Rauhmel Fox. Distribute emergency evacuation plans and procedures in a digital manner as per new firecodes. Upon checkin into co-working space people automatically will receive the info and graphics via SPARK. Received the Best Hack Using Cisco Spark / Tropo prize of $1,000. From Chicago. Hack: Phonograph by Alex Cordover and Alberto Rios. Received the Cisco Spark / Tropo Global prize of $700. From Kuala Lumpur. Hack: Susurri – Secret voice messaging. By James Ong. Received the Cisco Spark / Tropo Global prize of $700. Remote Submission. Hack: openions. By Babatunde Olajide. A voice survey web app. design for the purpose of taking health related survey in rural area in sub-saharan africa where the is little or no internet access except a telephone for voice calls only. Received the Cisco Spark / Tropo Global prize of $700. From New York. Hack: Virtual Healthcare Triage. By Germán Goldenstein, Nestor Bermudez, Arin Sime, David Alfaro, Juan Ignacio Serra. Received the Cisco Spark / Tropo Global prize of $700. From Brisbane. Hack: #FF0000. By Jason Lowe, Patrick Gauci, Louis Lee. Race car telemetry & accident workflow automation. Received the Cisco Spark / Tropo Global prize of $700. From Orlando. Hack: Spark Offline. By Bruno Genaro & Felipe Perina. Integrate Spark and Tropo SMS. Take messges in and out of Spark to Tropo SMS, and updates through dashboard. Received the Cisco Spark / Tropo Global prize of $700. From Berlin. Hack: Backup Call. By Stev Goodwin. Access your emergency contacts from any phone. Received the Cisco Spark / Tropo Global prize of $700. Remote Submission. Hack: Smart Patient Monitoring System. By Anupam Divesh and Sujeet Kum. Smart Patient Monitoring System is a web application integrated with all Hospital Department into a single Spark Room. Received the Cisco Spark / Tropo Global prize of $700. From Berlin. Hack Clipmonkey. By Tim Unkrig, Tammo Behrends, Markus Kerschkewicz. A decentralized, universal and fully encrypted clipboard. Received the Matrix global prize of a Macbook. From London. Hack: Matrix of Things. By Matt Williams, and Yin Yee Kan. IoT devices directly connect to Matrix, interfacing to Riot and a Tropo-powered TUI. Also uses Java (Tomcat), EL2, IBM Watson, an ESPB266 micro controller. Received the Matrix Global Prize of a Macbook. From London. Special Matrix Prize. Hack: The Hangouts Bridge. By Immanuel Baskacran. Bridges Riot with Google Hangouts using Matrix. From Lisbon. Hack: Re-light. By Pedro Rocha + Daniela Torrinha. Control a bluetooth light bulb with Re-Think platform. Received the rethink Global prize of $800. From Lisbon. Hack. Vintage Link. By Arthur Balanuta + Nuno Abreu + Afonso Oliveira. Taking chatrooms to legacy devices. Mobiles can join chatrooms via SMS. Using Telestax and reThink. Received the rethink Global prize of $1200. From Chicago. Hack: Accessibile Video Colors. By Vlad Beloborodov. Making WebRTC videos accessibe for color-blind people. Received the Telestax Global prize of $500. From Chicago. Hack: Little Endian Kitchen. By Sergio Gil, Caterina Lazaro, and Anup Mohan . Shopping Management For Your Kitchen. Received the Telestax Global prize of $250. From London. Hack: Deadspot. By Dalton Scott. Allows you to use apps without wifi. Received the Telestax Global prize of $250. From Madrid. Hack: EMT4ALL. By Jose Antonio González Robles. Public bus route info and planning via SMS. Received the Telestax Global prize of $500. From Madrid. Hack: EasyBuy. By Ramiro Blázquez González and Rodrigo Barbado Esteban. Mobile App with shopping recommender based on REST and SMS. Received the Telestax Global prize of $500. From Boston. Hack: Instavid, By Anshul Mittal. Received Voximplant global prize of $200. From Moscow. Hack: news hub. By Daniil Byalskiy and Kristina Barysheva. Platform for publishers to connect with citizen journalist. So publisher could get exclusive live-streaming video. Received Voximplant global prize of $300. From Moscow. Hack: Vcall_bot. By Alexander Daurkin. Videoconference inside Telegram. Received Voximplant global prize of $200. From New York. Hack: Virtual Healthcare Triage. By Germán Goldenstein, Nestor Bermudez, Arin Sime, David Alfaro, Juan Ignacio Serra. Received Voximplant global prize of $500. From Stockholm. Hack: Social help. By Vicotria, Nicolina. Uses TTS software together with phone numbers to help social workers to connect with their clients without bringing reports, but having them spoken out to the social worker. Received Voximplant global prize of $300. Athens (joint winners). Hack: Track your sales with sms. Team: Nikolaos Maris, Georgios Gkitsas. mHealth drug dispenser and distribution tracking system using Telestax. Athens (joint winners). Hack: Pre call actions for IoT Alert system. Team: Symeon Mattes, Vasilis Giatilis, Georgia Alexopoulou. Voice Alerts and Notifications for IoT, and Banking using Telestax. Berlin (joint winners). Hack: Vodka – local testing platform for Tropo by Stev Goodwin. Overcome the hassle of testing Tropo with a local debugging tool. Berlin (joint winners). Hack: Clipmonkey – intelligent clipboard. By: Tim Unkrig, Tammo Behrends, Markus Kerschkewicz. Decentralized, universal and fully encrypted clipboard using Matrix. Boston. Hack: Be My Guide. By Frank Ortiz. Call center guide. Brisbane. Hack: Bus-Bot. By: Jaimyn Mayer. Wit.AI natural language processing on Cisco Spark. Australia remote: Because we lost the Melbourne and Sydney locations at the last minute we created a ‘Australia remote’ location. Hack:Shared Shopping list. By John Lyons. Shopping recommendations app using Carrefour’s resources. Chicago. Hack: Grocery Go. Team: Bill Boyd, Sachi Shirasake, Ofra Orz, Rennell Garrett. Carrefour’s Augmented Reality and Telestax Customer Shopping Experience. Kuala Lumpur. MoniCam Video Monitoring by Abdul Razzak Alkel, Mhd Sami Al Mouhtaseb. Using Telestax. Lisbon. Hack: Athos. Team: Luis Tonicha + Tiago Dias. Bot for shopping assistance. Bot sends SMS to mobile. Using Carrefour, Matrix and Telestax. London. Hack: Moodlight. By Astrid de Gasté, Ryan Lintott, Tomas Zezula, Istvan Hoffer, Jing Chan. Sentiment analysis bot connecting to Philips Hue – analyses Matrix/Riot/Slack. London. Special Matrix Prize. Hack: The Hangouts Bridge. By Immanuel Baskacran. Bridges Riot with Google Hangouts using Matrix. Madrid (joint winner). Hack: EasyBuy. Team: Ramiro Blázquez González and Rodrigo Barbado Esteban. Mobile App with shopping recommender based on REST and SMS. Using Carrefour and Telestax. Madrid (joint winner). Hack: QR Carrefour. Team: Jose Antonio González Robles, Rafael Ortega Cáceres. Improve customer experience with payment. Using Carrefour and Tropo. Mexico. Hack: WatchMe. Team: Christopher Ojeda, Hugo de la Rosa, Carla Estrada, Armando Martinez, Daniel Carranza, and Alejandro Rosas. Provide education at anytime with no geographic, economic or technology limitations using Cisco Spark and Tropo. Miami (joint winners). Hack: Suicide Stoppers. Team: Jemia Sius, Alex Blattner, Oren Yehezkely. Team defined an important mission around mental health problems, depression and suicide. Decided to try to make an App that could help individuals self diagnose ,and then anonymously contact counselors using SMS. Using Tropo. Miami (joint winners). Hack: TADHack Sales Hotline. Team: David Crook, Jean Lapaix, John Cusack, Daniel Kamimoto. Team applied Machine Learning/ sentiment analysis to conference calls to help management examine how people feel and examine the trends across calls & time. Using Canonical and Tropo. Miami (joint winners). Hack: Dial-A-Song. My Ben Goldstein. Streaming music is popular, but hard to enjoy in areas with limited Internet infrastructure. Dial-a-song helps people enjoy music over phone call using Tropo IVR. Moscow (joint winner). Hack: smartis. Team: Igor Balashov, Eugeniy Zheleznyakov, Felix Ignatyev, Konstantin Poluektov, Dmitriy Ivkov, and Mike Berezin. Which provided a live translate service that uses ubuntu and voximplant to translate voice conversation between users in realtime. Moscow (joint winner). Hack: id4t. By Konstantin Zarudaev, Sergey Artyomov, Savin Roman, Sergey khaustov. Service connects owner of smart home and provider of smart system if something is going wrong and owner is offline, it calls him. Orlando: Hack: Trump Facts. By Kevin Coleman. SMS subscription service to receive automated Donald Trump facts. Keeps real-time dashboard of all subscribers. Using Tropo. Singapore (Outside the Box / Best Overall). Hack: OmniPresence. By Ivan Tan, Kenneth Phang, Nikhil Bhandari, Pang Poh Chye, Hayden Ong, and Ken Chan. Facial recognition for account authentication and authorization for online / offline shopping. Using Carrefour. Singapore (Most Complete Solution Prize). By Shreeniwas Iyer. Used Carrefour data set and WebRTC signaling to create real time advertising marketplace for mobile using contextual / transactional data to surface appropriate offers for users. Singapore (Social Good; Good Social Prize). By Bala Prasanna. Combination of social media listening and real-time communication to interact with customers. Singapore (Enterprise Focus Prize). By Selvaraju, Pramod, Premark, and Namasivayam. Enterprise Meeting Collaboration App. South Africa (TADHack Winner). Hack: Mobi Moolla. By Bertin & Team. Leveraging of MTN M2U transfers to assist with payment by airtime. South Africa (MTN Prize). Hack. Seven Eleven. By Sibusiso mvubelo & Sechaba Moeng. Data Usage tracker. South Africa (Girlcode winner). Hack: Pandora. By Naledi Phafane & Pule Phafane. Looking at the problem of residential addresses in overpopulated and rural areas where it is difficult to locate a home and deliver a package. The solution will track location / address changes and eliminate the need for proof of address. South Africa (Runner Up). Hack: Zitha. By Nndavheleseni Tshivhase. Accounting app for small businesses which can also be used as a marketing tool. South Africa (Runner Up). Hack: Geasy. By Robert Sandell. Energy monitoring solution using MQTT and Mobile IOT using Ubuntu. South Africa (Runner Up). Hack: Slackers (Rafiki). Team: Umar Dockrat, Thato Sebesho, Shoaib Ebrahim Khan, Nevin Moodley, Werner Geldenhuys. Relief on the load of customer care, using AI to answer a host of questions. South Africa (Most commendable Hack). Hack: We think code 2. By Arno & Team. The creation of a robotic orientated society utilising bitcoin currency. Sri Lanka (TADHack Prize). Hack: Walking School. Team: Nilanjan Meegammana, N P Vishwa Kumar, Aadeptha Samarakoon, Poornima Meegammana, Ravindu Ramesh Perera. Walking School – IoT and mobile based personal learning assistant to learn anywhere anytime using hSenid Mobile. Sri Lanka (Jaffna Winners). Team 3v1l with hack iAP by Ivan D Q Balendra, A.Arunpragash, and L.Praveenath. iAP is a proximity based mobile advertising. Customer & shop owners advertise based on location. User will get notified when reaching the area. Sri Lanka (First Runners Up). Team SAS Ninja Labs with hack iWRAP by Thuan Shafer Preena, Supun Harsha Priyadarshana, Ramindu Rusara Senarath, Tharindu Senanayake, Aqeel Hashim Mufthy. iWRAP is a mobile based smart optic wearable to prevent road accidents caused by drowsiness and fatigue for all the drivers. Sri Lanka (Second Runners Up). Team Apex with hack Raven by Lahiru Jayathilake, Manujith Pallewatte, Yasith Jayawardana, Vikum Bandara, Sandaru Seneviratne. Raven is a real time customer reaction monitoring and alerting system for the hospitality industry. It uses face and emotion recognition to determine the reactions and hSenid Mobile SMS APIs to deliver alerts. Stockholm. Hack: Eye tracking, using Canonical. Team: Simon, Poja, Daniel, Kimmy, Linda. Using accelerometers to track peoples head movement and send a notification message when the person is threatened to fall asleep. Ukraine. Hack: BotFunnels. Team: IGOR TSALENCHUK CTO, backend MAX ZHURAVINSKY, Frontend developer MARY YASKO, Frontend developer ANTON KOVALENKO, Backend VITALIY GODZEVICH, Telecommunications Vladislav Pletnyov, Telecommunications Vyacheslav Oleynik. BotFunnels is a marketing automation campaign manager that uses chat bots in messengers. Using Cisco Spark and Tropo. Voronezh. Hack: Cell Network Monitor & KPI Analyzer. By Andrey Sorokin, Alexander Kasheverov, Alexey Chernyshev. A monitor for cell networks used on client-side, gatheres detailed info on connection quality and drop zones. Have working prototype and field tests. Warsaw (Location Prize). Hack: CloudIVR.io Restcomm Backend. By Grzegorz Siehie?. Showcase replacement of CloudIVR.io backend based on FreeSwitch with Restcomm. Warsaw (Play Prize). Hack: Smart Alarm. By Bartosz Krok. IoT hack using location from PlayAPI and Restcomm as telco gateway – it enables proximity alarm when user is not home. Warsaw (Joint T-Mobile Prize). Hack: N.I.M.R. Concept. By Adrian Or?owski. Recognition of music via ACRCloud facilitated by Restcomm – similar to the popular services such as Shazam the user of a legacy feature phone just holds the device near the music which he wants to recognize and dials the NIMR service. Restcomm takes the call and connect to ACRCloud which recognizes the song. Restcomm sends song details to user via SMS. Warsaw (Joint T-Mobile Prize). Hack: Drive Safe. Team: Adam Ko?uchowski and Pawe? Stobi?ski. Hack uses location from PlayAPI to detect that user is driving, then automatically replies to incoming calls with announcements and intercepts incoming SMS for defferred delivery. This helps the user to drive more safely without being disturbed by mobile. Warsaw (Joint T-Mobile Prize). Hack: Easy Voter (EzVoter). Team: Adam Ko?uchowski and Pawe? Stobi?ski. Enables creating on-the fly surveys accessible via SMS and IVR functions. Can be used by e.g. teachers in developing countries no/slow internet and feature phones. Location from PlayAPI enables such features as proximity survey – information is sent only to users in given location. Zambia (TADHack Prize Winner). Hack App Close. By Andrew Mwanza. A generic cross platform (web/mobile – android, ios & windows application) that gives you general & vital information of universities/tertiary institutions using a simple click – touch & browse function. Zambia (runner-up, MTN Zambia prize Hoverboard). Hack: Agrisafe. By Chilumba Machona (Team Lead), Bob Ndatoya, Garry Muhone, Malambo Given. A crowd source data platform that allows farmers make better farming choices by providing them with information suited to them. Zambia (runner-up, MTN Zambia prize JBL Bluetooth speaker). Hack: Cognifly by Kampamba Chanda. A search engine that delivers Zambian content. It was pleasure to participate there! Thank you for the event in Voronezh! Thanks Tadhack hsenid mobile and ideamart ! It was pleasure to participate in the TADHACK /Ukraine in the office of DataArt, my congratulation to IGOR TSALENCHUK who bring the new and bright idea and organize powerful team for implement it. Thanks for hosting, thanks for cooperation to Igor, and god luck! Organization of TEDHack in Kiev, Ukraine was BEAUTIFUL! Thanks to DataArt! Thanks to all participators for fair competition, and we won with BotFunnels project also thanks to them. When participacing in Moscow part of TADHack, I had unique feeling of belongness to the global hacking community. I liked the event, its spirit and its excellent realization. a part of News Hub team.